Mazis, Glen A. 2008. Humans, animals, machines : blurring boundaries. n.p. : Albany, N.Y. : SUNY Press ; Bristol : University Presses Marketing [distributor], c2008., 2008. DEAKIN UNIV LIBRARY’s Catalog, EBSCOhost (accessed June 10, 2014). “In the twenty-first century, the boundaries between both humans and machines and humans and animals are hotly contested arid debated. 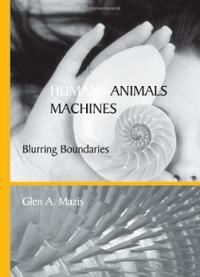 In Humans, Animals, Machines, Glen A. Mazis examines the increasingly blurring boundaries among the three and argues that despite their violating collisions, there are ways for the three realms to work together for mutual thriving. Examining Merleau-Ponty, Heidegger, and Haraway; artificial intelligence that includes “MIT Embodied AI”; newer holistic brain research; animal studies; the attachment theory of psychologist Daniel Siegel; literary examples; aesthetic theory; technology research; contemporary theology; physics; poetry; machine art; Taoism; and firsthand accounts of cyborg experience, the book reconsiders and dares to propose a new type of ethics and ecospirituality that would do justice to the overlapping relationships among humans, animals, and machines.”–BOOK JACKET.